Many short story collections start off promising but become diluted by the time you reach the last page. 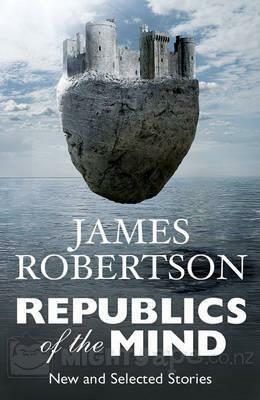 But James Robertson’s Republics of the Mind starts with earlier, published stories and builds up to his stronger, newer stories. Robertson tackles a heck of a lot of genres in one short story collection, ranging from literary to horror to a hellish future. The opening story, Giraffe, sets the tone for the rest of the collection with characters struggling to find a place in society and dealing with inner torment as they deal with expectations from society. The reader is offered a glimpse into a dysfunctional safari park in Giraffe, where animals and their keepers can not be controlled by the boss. The Claw is a tender story of two conflicting characters. A young man living with HIV, struggles with his own mortality while he sits, watching over his ageing Grandfather. One character’s illness is attacking him physically and the other is being attacked from within. This story shows Robertson’s great skill in creating characters and exploring the relationships they have with themselves, with society’s expectations and with other characters. “In the last year I’ve studied my soul from all sides, and every morning I begin the examination again.” From The Claw. Another stand out story for me was The Plague, which tells the story of a man who believes he is being stalked by frogs and that they are trying to infiltrate his life. Paranoia and fear grow in this tense story as he wanders the streets, catching glimpses of frogs until he returns to his flat to finds every corner jam-packed full of frogs. This story reminded me of American Psycho as I could never quite tell if the frogs were real or part of his imagination. Robertson explores the way the mind works when faced with unsettling truths and what people will do to survive, which we see, in one of the strongest stories in the collection, MacTaggart’s Shed. This chilling story shows a future Scotland, which has been plagued by ethnic cleansing. Christie, who lives on the fringes of his village and of society, is haunted by the events that happened in the nearby barn, when his Brother-in-Law, with the help of some locals, rounded up and killed a lots of people. He locks himself away from the world and numbs the pain with drink and becomes consumed by the past. Robertson successfully delves into the torment that many people face in their lives – being torn between good and evil, being accepted and or being an outcast. Republics of the Mind is an interesting showcase of Robertson’s short stories, There are a few times where he wraps a story up a bit too early but he definitely makes sure each story is different from the previous story. I will definitely be seeking out his novels.